The Mainstays Parsons TV Stand is just the right size for your flat paneled TV up to 50 wide. 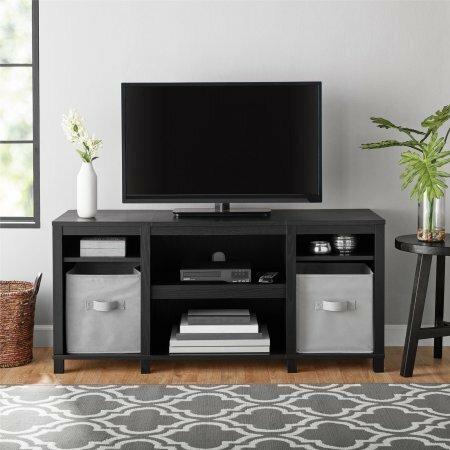 This TV Stand has tons of open storage so you can keep your cable box and gaming system in the center 2 shelves and still have room to organize your books, remotes and DVDs on the other 4 shelves. If you want something with the option of closed storage, this stand offers 2 lower cubbies that are the perfect size for fabric storage bins not included. The Parsons TV Stand has been tested for TVs up to 50 wide with a maximum weight of 55 lbs. Two adults are recommended for assembly. If you have any questions about this product by Mainstay.., contact us by completing and submitting the form below. If you are looking for a specif part number, please include it with your message.